We’re well past the days when a business could create a Facebook Page and call it good. As new social platforms, algorithms, and advertising models have arisen, social media marketing has gotten a lot more complicated. Now, some of the latest trends in social media advertising involve using specialized tools and strategies to reach a highly relevant audience at the right time. Since we’re approaching the end of 2017, we decided it would be a good time to take stock of some of the rising social media marketing trends for 2018. Chatbots (those chat boxes that pop up online to ask if you need assistance) are already a common sight on business websites. It’s easy to see the appeal: chatbots can simulate human conversation and help website visitors find what they’re looking for without having to call or email a customer support agent. More chatbots will interact with users across multiple platforms. Chatbots will get better at using consumers’ data to make personalized recommendations. We’ve already seen examples of these smarter chatbots this year. Facebook released their Customer Chat plugin, which lets businesses integrate Facebook’s Messenger platform with their own site so that customers can continue chatting with a business any time they’re online. The plugin is currently in closed beta, and several airlines are testing it out. Meanwhile, Twitter has released a feature that lets users interact with a branded chatbot over their Direct Messages. 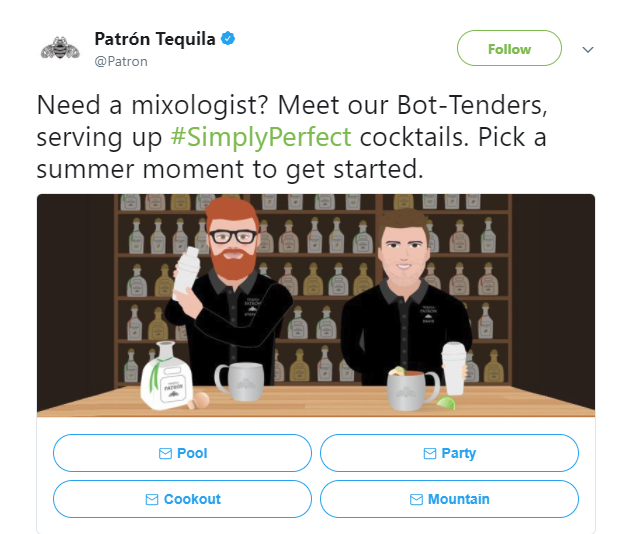 The tequila brand Patron used this feature to run a “Bot-Tender” campaign where a chatbot gave users personalized recommendations for cocktails based on their answers to a series of questions. We’re not going to see chatbots replacing human customer service reps anytime soon—chatbots are best-suited to simple queries and product recommendations. However, as chatbots become more sophisticated, we’ll see growing acceptance of chatbots as a means of communicating with brands on social media and beyond. Chatbots aren’t the only thing getting personal. Marketers are getting better at tailoring their content to the interests of specific consumers, and social media platforms are making it easier for marketers to customize their ads. Dynamic ads are now one of the biggest emerging trends in social media advertising. This fall, Facebook unveiled a new dynamic creative tool which will show different combinations of ad components (such as images, headlines, and calls to action) to audiences based on their preferences. This dynamic ad tool will put the ‘big’ in ‘big data.’ Advertisers can add up to certain assets to each ad, resulting in up to 6,250 unique combinations. Facebook will analyze which versions perform best with each audience, giving advertisers the insights they need to run more effective social ads. YouTube also has a new tool, called Director Mix, that lets marketers generate thousands of different variations on one video ad. Marketers supply all the video ad components (including voiceovers, background, and text), and Director Mix puts together different versions to align with different audience segments. Campbell’s Soup is one brand that has already benefited from YouTube’s Director Mix. They used the tool to directly relate their product to the content their viewers were about to watch. For example, someone who was watching a clip from the show Orange Is the New Black would be served an ad with the copy: “Does your cooking make prison food seem good? We’ve got a soup for that.” Appealing to their audience’s personal interests paid off for Campbell’s: the campaign netted them a 55 percent lift in Simply Soup sales. Branded video has been one of the fastest growing social media advertising trends of the last few years, and most businesses are using video marketing in some capacity. According to Hubspot, 85 percent of businesses have staff and resources to produce videos in-house. And even businesses with limited internal resources can benefit from live video streaming on Facebook, Twitter, and other social platforms. The less polished, more personal nature of live video makes it a good medium for sharing company events, clips of products being built, behind-the-scenes workplace footage, and quick news updates. Live video lets brands break down the typical formality of advertising and interact more authentically with their audience. And, as an added benefit, Facebook’s algorithm pushes live videos to the top of the Newsfeed, increasing a brand’s likelihood of being seen organically. If your business decides to use live video next year, keep in mind that “less polished” doesn’t have to mean amateur. If you’re streaming a live interview, for example, you should still make sure you have good lighting, a camera on a tripod, and a company representative who is comfortable in front of the camera. If you’re streaming something a little less structured, like your team’s charity event, you should still have a clear understanding of the story you want to tell. In the (relatively) early days of online influencer marketing, brands with large marketing budgets would pay celebrities to endorse their products on social media. This allowed brands to get their products in front of a celebrity’s large social media following, and many brands saw this visibility alone as a win. However, as influencer marketing matures, businesses of all sizes are realizing that they need to do a better job of measuring the results of their campaigns. This is especially important as brands increasingly seek to partner with micro-influencers who don’t have the reach of celebrities like Kim Kardashian or DJ Khaled, but who do have engaged followers in their niche and may deliver a higher ROI than bigger-name personalities. Influencer marketing will continue to grow in 2018, but marketers must be able to measure their success to prove to the C-suite that this strategy is worthwhile. Think we missed one of the biggest social media trends for businesses? Let us know in the comments. Don’t forget to sign up for our newsletter for more digital marketing news, tips, and predictions. What are your thoughts on Facebook continuing to decrease organic reach? Will it result in companies investing more into their advertising, or will they start looking for alternatives?